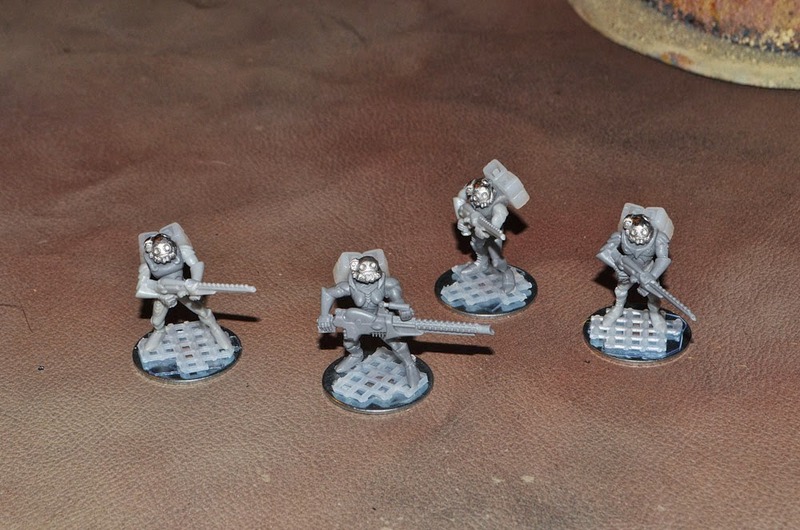 I've been working on a small Earth Security Force army this week for my Solar Empires setting. The Earth Security Force consist of mostly drones and robotic troops but there are a few "human" troopers called Ghost. Ghost are elite jump troopers who wear holographic armor that helps them blend into their background. I made these troops from old Dark Eldar models from Warhammer 40,000. I cut down their "spikey bits" and added some heads from Pig Iron Productions as well as jump packs I scratch built from small zip ties. Looking forward to seeing them painted up. Great conversions! Your ideas are inspirational.